St Michael's Mount is recognised throughout the world and is just a few minutes walk from our Marazion Holiday Cottage. There's plenty to do during your stay - and lots to do without the car - visit the Great Scenic Railways of Devon and Cornwall web site for rail information and other links. Try starting with Marazion: The Official Guide. Marazion sea front is just a minute’s walk from The Haven. It's a great place to stroll and look across the bay towards Newlyn and Mousehole in one direction and the Lizard Peninsula in the other. Marazion Marshes are well known for migrant and native bird watching. And of course, we are right by St. Michael's Mount which can be reached by walking the causeway at low tide. Marazion beach also has a fenced children's playground. 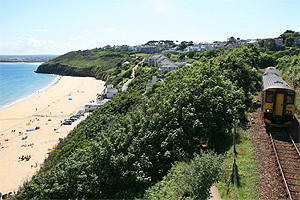 The location is convenient for walking the South West Way and for cycling the country lanes. Broad expanses of golden sand slope gently to the waters edge. There are rock pools to explore and plenty of space for games. 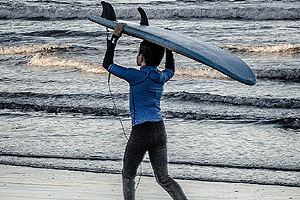 The Haven is an ideal base for visits to the famous surf beaches of Sennen, Hayle, Newquay and Watergate Bay. Kite surfing is another popular activity. Sea fishing trips leave from the many harbours near Marazion. and see if there is one for you when you are on holiday: Website. 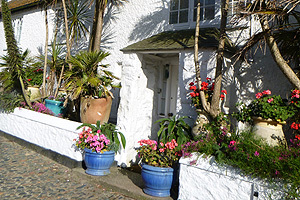 For anyone who loves the sea, the cliffs and Cornwall scenery, The Haven is a ideal holiday cottage. 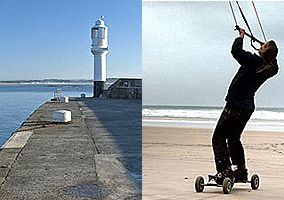 Marazion is an ideal base from which to explore the whole of West Cornwall. This website and its content is the copyright of Alison Donnelly. All rights reserved.